Jefrai Murib, whose name is also sometimes written as Jefray, Yaprai or Yaprey, was 19 years old and studying at a local high school in Wamena town, Jayawijaya district when he was arrested following an alleged raid on the Jayawijaya District Military Command weapons arsenal on 4 April 2003. Arrested on 11 April, Mr Murib was then brought to the District Military Command. According to a report by the Office for Justice and Peace (Sekratariat untuk Keadilan dan Perdamaian, SKP), Mr Murib was blindfolded, beaten with a 5x10cm wooden bar, and had cold water poured over him twice whilst being asked whether he was involved in the raid. He stated that he was not involved. A report by a local NGO coalition states that initially, Mr Murib, Apotnalogolik Lokobal, Kanius Murib, Kimanus Wenda, and Numbungga Telenggen were detained in the Jayawijaya District Military Command for around five days, far exceeding the 24-hour limit for military detention. They were then handed over to the Jayawijaya Police Station on 15 April 2003. The SKP report states that when Mr Murib and the other detainees arrived at the police station, the police sent them to the local hospital for a medical check. Doctor Berry Wopari reportedly found that they had all sustained severe wounds and were unwell, with the exception of Kanius Murib. An undated report by Alliance of Democracy for Papua (Aliansi Demokrasi untuk Papua, ALDP) noted many accusations of irregularities in the trial. These included the lack of translators and the prosecution remaining almost silent throughout the trial as their role was being assumed by the judges themselves. The judges reportedly failed to respect the defendants’ rights to be assumed innocent until proven guilty, and pushed the prisoners to accept the state’s version of the story. They also repeated prejudices about the local people of Wamena, such as “people here are lazy and stupid.” According to a document signed by a government official based in Jayapura, Mr Murib was found guilty under the charges of treason (article 106 of the Indonesian criminal code) and conspiracy (article 110) and was sentenced to life imprisonment. There have been a number of concerns raised about the treatment of those incarcerated in connection with this case. In 2004 while imprisoned in Wamena prison, Mr Murib and the other people accused of the raid on the weapons store were reportedly “still being intimidated by the intelligence of the Military District Command and Police Mobile Brigade, even when in jail,” according to Ms Anum Siregar, a member of their legal team. They were also allegedly being denied access to the prison hall, where they were supposed to be able to meet their families or take exercise, because the military were using it for their own purposes. A report by ALDP (2008) describes the forced removal of Mr Murib from Wamena prison, where he was initially held. On 15 December 2004 he, along with eight other prisoners, was reportedly woken in the middle of the night, beaten until bruised and bleeding and forced to get into a police vehicle. The prisoners were moved to Gunung Sari prison in Makassar on the island of Sulawesi, far from their families. The sudden nature of this move caused fears for their safety at the time. 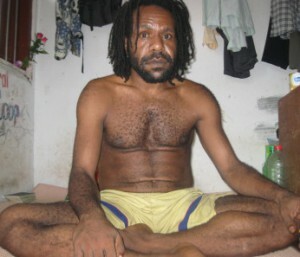 Following the death of fellow prisoner Michael Heselo in Makassar hospital in August 2007, the remaining eight prisoners were moved back to Papua. Mr Murib was brought to Biak prison on 28 January 2008, along with Numbungga Telenggen and Apotnalogolik Enos Lokobal. Mr Murib continues to challenge the severity of his sentence, and is seeking a reduction from life imprisonment to a fixed term sentence.